It’s great to be a fully-fledged member of the Golden Generation, living the high life on our occupational and state pensions, riding around for free on our bus passes and merrily turning up the thermostat in anticipation of our heating allowance being increased by that nice Mr Osborne, a fitting successor to that nice Mr Lloyd George. All of a sudden, cinema tickets are cheaper, Senior Meal Deals can be demanded and there are endless opportunities to buy chairs that allow you to rise carefully, baths that allow you to walk in to them and incontinence pads that allow you to…… well, we’ll not go down that road. But then something happens which makes your mortality seem just that bit more fragile and such a thing happened a couple of hours ago when I heard of the death of Johan Cruyff. For many of us, he summed up the change of football from a game that was dependent on physical strength and an element of brute force and into a game that was much more thoughtful, skillful and scientific. 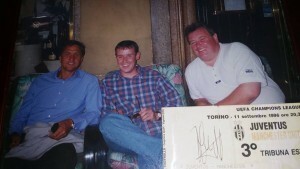 From Facebook and our old pal Barry Emmerson: ‘1996 in Turin. We had gone to see Juventus v Man utd in the European cup and this was the day after as we were waiting for the coach to take us to the airport. He said “I have heard of the famous Emmersons. Do you mind if I have my picture taken with you. Naturally we said: “Yes of course you can.” This is the result. His impact on the game was probably second only to that of Pele. In the pantheon of greats, he is the only European alongside the Brazilian and two Argentines in Maradona and Di Stefano and he showed that football was indeed “the beautiful game”. Nobody of our era will ever forget the “Cruyff Turn”, executed in a 1974 World Cup game against Sweden which astonished David Coleman and the entire viewing public. I saw him twice. Both occasions were in 1975, once at the Olympic Stadium in Amsterdam and the other at Elland Road in Leeds. Barcelona managed to lose both games, the latter being a European Cup semi-final against Jimmy Armfield’s United side as they went on to the final against Bayern Munich in Paris. Cruyff was quiet that night, but I saw him play even if it was from afar. As one great player leaves us permanently, another professional footballer disappears out of circulation for six years. Adam Johnson will probably be out of prison after three but he will return to a world which will shun him and will surely not re-employ him as a footballer. His name will barely be uttered by Sunderland supporters in the future and his malignant influence in the dressing room has gone for good. He has brought shame on the club that we follow (although the club did little to assuage that by their actions after he was charged) and I am sure that we are pleased to see the back of him and the whole sordid case. It’s another thing to try the patience of the long suffering red and whites, something which Chris Sutton picked up on on 5Live on Monday night. I missed it as I was yawning my way through the Under 21 game at Middlesbrough, but he pitched into us and not for the first time. Last year, he likened us to a pub team after that embarrassing 4-0 home defeat to Villa, something which I thought was harsh – on a pub team. This year, he said that it must be terrible watching a team who are always struggling to avoid relegation and that we must all be bald and grey with the strain. Now I quite like him as a pundit. He does not pull his punches and is often openly disdainful when commentating on the Scottish games I have watched on BT Sport. He has even criticised his brother, currently galumphing around for St Johnstone in the SPL. But what he fails to understand is that you support a club not because of its success rate but because it is your club and you go every home game hoping that things will get better. As an ex professional, he won’t understand this. He transferred his allegiance from Norwich to Blackburn to Chelsea to Celtic to Birmingham City to Aston Villa, ending up at non-league Wroxham (1 game only). Nothing there to suggest that he could become attached to a club or that any of them would seep into his psyche. Maybe he should praise the resilience of the 40,000 who turn up every home game and compliment them on their blind faith and their desire to see their club succeed. Sometimes it is much easier to make a cheap crack than it is to understand what motivates football supporters. Relegation watch: Villa, plus two from Newcastle, Norwich and Sunderland. Johan Cruyff is not only the greatest player I ever saw live (just once) but in my opinion is the greatest player ever (yes, above Pele, Maradonna and Messi). He was the leader of a golden generation of Dutch footballers which should have ruled the world. They began my long time love affair with all things orange, so much so that I now support Holland at major championships rather than England. RIP. As for Chris Sutton’s remarks, yes it’s currently hard work watching Sunderland. 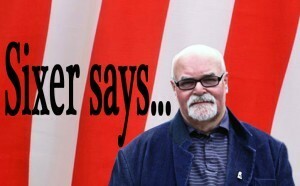 However, being a Sunderland supporter is absolutely brilliant. winner’s medal, in contrast to Maradonna and Pele. Whatever, 3 superb players and I would add George Best to my complete my list of greats. Sutton laughed at us on final score when we were getting stuffed by Leicester in the first game. Le Tissues is similarly dismissive of us. Us fans don’t like that. Sutton was crap in the 92 semi-final, probably the most inept centre forward ive ever seen in such a big game, maybe he bears a grudge? Cruyff-genius , Sutton – southern bore, Johnson – words fail me . Yes I too refelected on the irony of the day.One of the players who made me love football in the first place as a young boy,and one who has ruined watching professional fooball for me as an older man.